Going booth after only four games, the cubs marketing brass tapped new Cubs radio color man and Ron Santo replacement to stretch today. 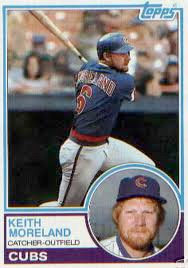 As a color man, Keith Moreland continues in the Santo tradition of ex-Cub players and was a catcher at Wrigley for 6 of his 12 major league years. The time at the Friendly Confines must have paid off as he actually sounded pretty good singing "Take Me Out to the Ballgame." A hard emphasis on both the first and second "Take" got the rendition out to a very harsh, staccato start but Moreland evened it out for a well-tempoed, sing-songy rendition. However, a slight voice crack on "Cub-bies" foretold of pain to come. But no reference to Ron Santo during the stretch and a straight-forward finish of "Let's get some runs!" at the end, along with a solid tune throughout made this a very workmanlike effort. A well-played opening stint by Moreland. So we had No Santo, a hard start, a slightly cracked "Cub-bies" but overall a good tempo, an even voice throughout and a strong ending. The game mimicked Moreland's tune with a D-bags homer to start the game and some cracking in the eighth when SS Starlin Castro took his time with a routine grounder and had to hurry a throw to first, letting a D-bag on with one out. Two more D-bags got on base before Kerry Wood - who is no stranger to stretch-jinx - recovered and ended strong, holding onto the one-run lead with a clutch, danger-ending strike out and a harmless fly ball. 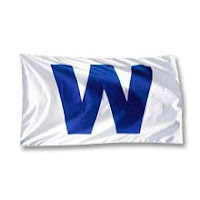 The strong finish in the stretch meant a strong end to the game as the Cubs got some long doubles in their half of the eighth and held the D-Bags off the boards for a good win. - One topic of choice in the booth was - surprisingly - other Montana-players besides D-bags pitcher Kam Mickolio who is from Wolf Point, Montana. Pat actually listed off 5 other players from Montana and there was talk of a wolf-coat to end the bizarre exchange. - Starlin Castro shared the NL player of the week. What a stud.